Step 2: Drag and drop your clip into the workspace so that you can edit it. 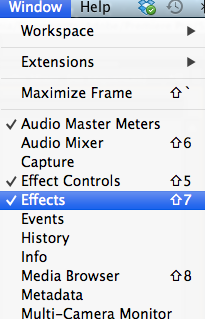 Step 4: On the top of your workspace, click on the “Effects Controls” tab. 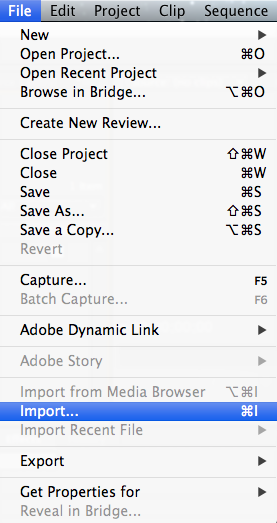 If the tab is not viewable, you can also click on Window>Effects from the menu bar. Tip: Before you change the opacity, try zooming in to your video to about to the seconds, so you can decide how many seconds you want your fade to last. 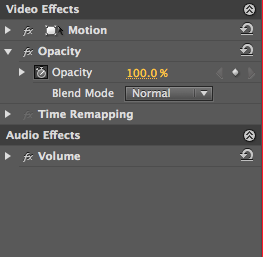 Step 6: Change the opacity from a 100% to 0, making sure you are at the absolute beginning of your video clip. Step 7: Next, say if you want your video to take 3 seconds to fade in, go the 3 second mark on your video, and change the opacity to a 100%. Now when you hit play, your video will start with a fade-in for 3 seconds until the opacity returns. ~ by vs1085 on November 11, 2013. This is an extremely clear and thorough blog post. I appreciate the screenshots and language choice. My only real suggestion would be to clarify how opacity affects fading in. Other than that, nice job! It would help to have a visual of the fade on the video clips, like if you took a snapshot of the timeline where you have the clips and the effects applied, or maybe a shot of how the video looks as it’s fading in. maybe you could also talk about cross-fading clips using this same technique, and again then you could have a shot of the clips as they are fading into each other.